THE Tasmania Fire Service has declared a Total Fire Ban for the 24 hours from midnight tonight, Tuesday, February 14 until midnight on Wednesday, February 15, 2017. This will affect the following municipalities: Derwent Valley, Central Highlands, Brighton, Glamorgan/Spring Bay, Kingborough, Glenorchy, Sorell, Clarence, Hobart, Southern Midlands, Huon Valley and Tasman. Current weather predictions provided by the Bureau of Meteorology indicate very high fire danger ratings for several districts in southern Tasmania for Wednesday, February 15. The declaration of a total fire ban means that no fires can be lit in the open air. Tasmania Fire Service requires landowners with fires already burning to make sure they are completely extinguished. 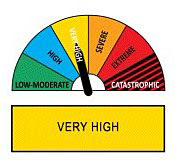 "Some areas in the southern region, particularly the southeast, may see temperatures of up to 30 degrees and wind gusts up to 80km/h which will push fires rapidly making them dangerous and difficult to control" Tasmania Fire Service chief officer Chris Arnol said. "Although temperatures over the previous few days have been relatively mild, grass and forest fuels are now very dry and in abundance due to the ongoing rain continually promoting growth growth over the spring summer periods" Mr. Arnol said. "When instances of high fire danger occur, it is important that people know exactly what to do if a fire threatens their home or property. To assist with this planning, residents are encouraged to visit the Tasmania Fire Service website to view the Community Bushfire Protection Plans for their area. These are developed to provide assistance in the event of an emergency that will inform residents of Nearby Safer Places, evacuation routes and how to receive emergency information. Information is also included that will assist in preparing individual emergency plans prior to a fire occurring." More information on Total Fire Bans and incidents in your area can be found at www.fire.tas.gov.au.